Step 1 加入 0.5ml 以上的抗體量至 spin cartridge. 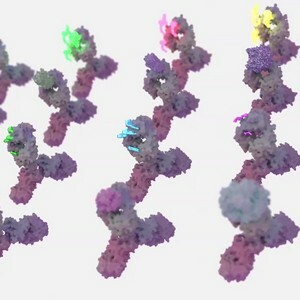 Antibodies are sometimes only available at low concentrations and often contain low molecular weight substances that interfere in labeling reactions with enzymes, biotin, streptavidin and fluorophores. The Antibody Concentration and Clean Up Kit allows for the quick and easy concentration of antibodies and proteins. The kit can also be used to reduce the concentration of many unwanted additives often found in antibody formulations such as azide, glycine or tris. The antibody clean up kit method utilizes a simple spin column to easily and quickly remove excess buffer from the antibody thereby providing a more concentrated antibody solution. The clean up kit also allows the experimenter to perform a simple buffer exchange to transfer the antibody into a more favorable conjugation buffer. 請確認抗體的保存條件。傳統市售的抗體標誌套組，在使用前皆需dialysis純化，將抗體保存的物質移除。Lightning-link抗體標誌套組在大部份的保存條件下，不需要再dialysis的步驟，例如一般salts (e.g. NaCl)、sugars(e.g. sucrose)、及chelators (e.g. EDTA)不會影響標誌的活性。大部的市售的抗體保存在1%BSA、0.5%Azide及0.5% Gelatin 輕微或幾乎不會影響標誌的活性。在少數情況下，若是您購買的抗體保存在amino acids(e.g. glycine)、blockers(e.g. ethanolamine)及thiols(DTT, mercaptoethanol)情況下，記得純化您的抗體，(abselect抗體純化套組) 避免抑制您的標誌活性了!